I had an invitation to be a part of the Road Runner Sports VIP Christmas Party at the Walnut Creek Center in Westminster. I brought along an assortment of Soothing Rain Recovery Cream and my Self Massage for Recovery DVD as well as Holiday Gift Certificates. Their Grassroots Representative, Sam, did a great job organizing the event. Members went from vendor to vendor, collected a signature and then were eligible for prizes throughout the evening. 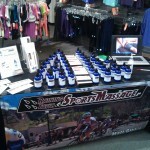 I enjoyed meeting lots of new folks and talking to them about massage, self massage and injury prevention. 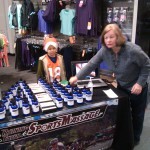 My wife, Pam, was a good sport and came along to help with setting up and processing sales. I’m looking forward to more involvement with Road Runner Sports in 2014. Sam and I are looking to do a clinic on lower leg pain involving plantar fascia, the achilles tendon, shin splints and the musculature involved with these areas. It will be an expansion of my video on YouTube, Self Massage for Plantar Fascia Pain. So stay tuned for an announcement on the specific date. Merry Christmas and Happy Holidays to everyone from Raining Faith Massage! Pam Gibble helps out at the party! A Christmas Tree of Massage Cream and DVD’s! 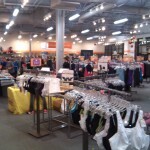 This entry was posted in Events and tagged massage, Road Runner Sports, Running, Self Massage by Matthew. Bookmark the permalink.